Customer Service is What We Are About! Since 1991, Tides Marine, located in Deerfield Beach Florida, has provided essential marine components to the marine industry. At Tides, providing Excellent Customer Service is our Number 1 priority. Tides Marine is the manufacturer of the Drip Free, Self Aligning, SureSeal Shaft Seal, Rudder Bearings, Rudder Seals and a SailTrack and Slide System. Our products improve vessel performance and reliability, solve unique system issues, reduce the need for scheduled maintenance and provide worry-free, long-term boating enjoyment. Tides Marine is the US Master Distributor for MATE-USA Pumps, Horns & Rubrail as well as Super Stainless, a gel based, non-abrasive, stainless steel cleaning agent. Tides Marine has locations in Florida, California, United Kingdom, Spain, Poland, Latin America and Australia. Click HERE for more information. If you already know the product you are looking for and you just want to purchase it or get pricing, go to our WebStore by clicking on WEBSTORE on the far right hand side of the menu above or just CLICK HERE. 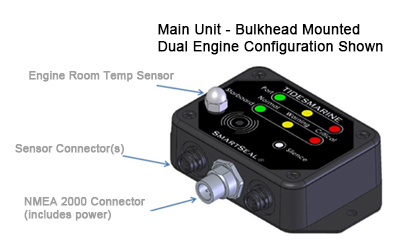 Completely RE-DESIGNED from the ground up, the ALL NEW SMARTSEAL TEMPERATURE SENSOR that will connect to your existing NEMA 2000 System. Don't have a NEMA 2000 System on-board, no problem. We have the ability to run without one as well. International BoatBuilder Exhibition and Conference 2019 in Tampa Florida.